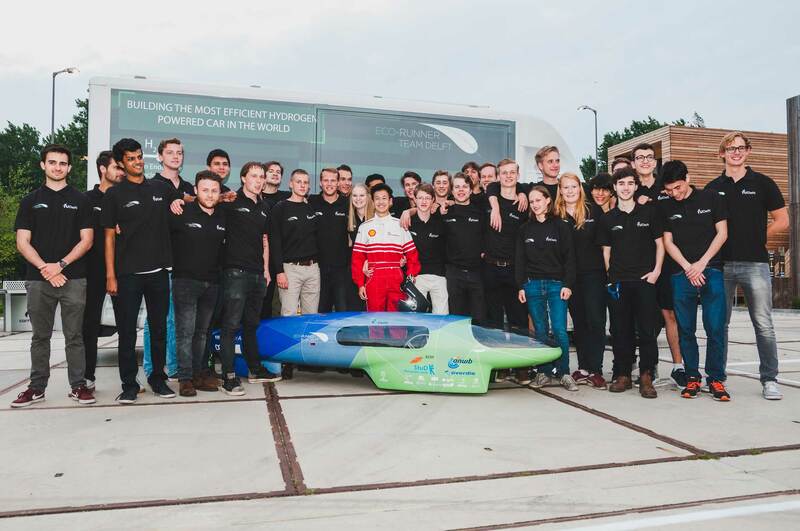 Next to the challenge of building the world’s most efficient hydrogen powered car we, from the Eco-Runner Team Delft, want to speed up the energy transition. We put a lot of effort in spreading information about the green hydrogen economy. As we believe the opposing factor for the green hydrogen economy to start is lack of information and not technical issues. By showing what the possibilities of hydrogen are in mobility and sharing the background story of the green hydrogen economy, we try to accelerate the energy transition! Every year we build a prototype hydrogen powered car, with this car we race in the Shell Eco-marathon. The objective at the Shell Eco-marathon is to drive 16 kilometers in under 40 minutes in every run. The hydrogen consumption is then measured. The team that uses the least hydrogen in a single run wins. The challenge for us is to increase the performance of our car step by step. By decreasing weight, designing new powertrain systems, using our data to make optimal race strategies and optimizing aerodynamics each year, we were now able to build a car that drives up to 9000 kilometers on a kilogram of hydrogen. Our team aims to develop a new vehicle which is lighter and more advanced in order to break our records and to win the Shell Eco-Marathon. Every year it is a great challenge to design and build a car that is as light as possible to secure the title of the Shell Eco-Marathon. Using finite element methods, choosing the right materials and making no mistakes in our production processes is crucial for the weight of the car. To make increases in our efficiency for the Eco-Runner, we decided to change our motor with chain transmission to a direct transmission by using an in-wheel motor. The neural network that was made last year by our strategy department, to optimize our race strategy is going to be improved and used even better this year. The ultimate goal is to create a smart cruise control in which our race strategy software drives our engine.